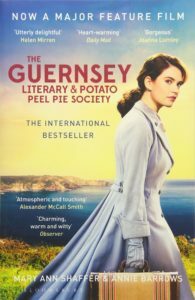 The Guernsey Literary And Potato Peel Pie Society by Mary Ann Scaffer and Annie Barrows is a positively charming historical novel. There is a totally wonderful film too which I saw before reading the book. Uniquely laid out in a series of letters, the reader enters a bygone age. Life was simpler but life was hard living under the Nazis in occupied Guernsey. Set during 1946 the letters discuss the war years. There is a bonding together of residents, united by their love of food and books. There are some hard to read scenes set in Ravensbruck and Belsen concentration camps.